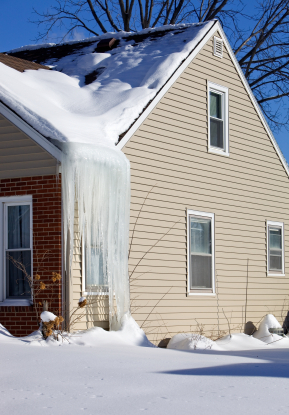 An ice dam is a ridge of ice that forms at the edge of a roof and prevents melting snow (water) from draining off the roof. The water that backs up behind the dam can leak into a home and cause damage to walls, ceilings, insulation, and other areas. 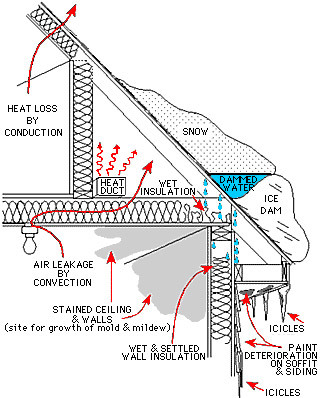 Figure 1 shows a cross section of a home with an ice dam. Copyright © 2010 Regents of the University of Minnesota. All rights reserved. The snow on a roof surface that is above 32°F will melt. As water flows down the roof it reaches the portion of the roof that is below 32°F and freezes. Voila!—an ice dam. Source: University of Minnesota. “Ice Dams”. Timothy Larson, Lewis Hendricks, and Patrick Huelman, Revisions by Richard Stone (2009).